What is a Healthy Weight Loss per Week? If your waistband is feeling tighter than usual or your jeans just won't zip up anymore, the change in your weight likely didn't happen overnight. 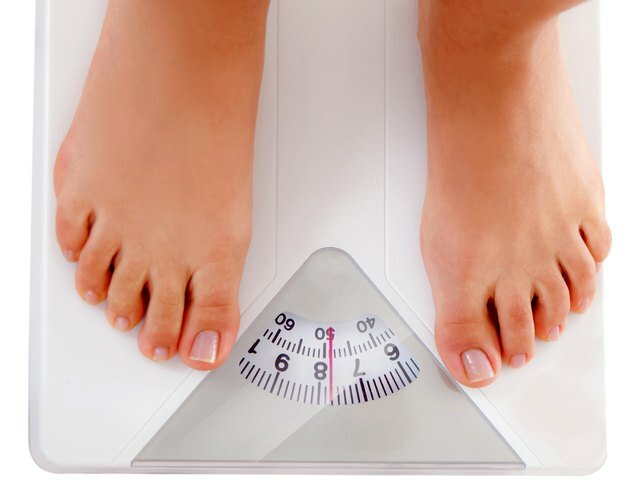 Americans put on weight at the rate of roughly 1 to 2 pounds a year, according to a review published in 2013 in AHRQ Comparative Effectiveness Reviews. Although that small gain might not seem alarming, those little pounds accumulate over time, leading to overweight and obesity. Your best bet for healthy weight loss is to ignore diets that promise instant results and to take the weight off slowly but surely, a pound or two a week. Using a calorie counter helps you stay on track and ensure you're getting the necessary nutrition every day. Any diet that advocates quick weight loss is likely just a fad. These diets generally do not present healthy, long-term solutions to weight management; instead, they focus on helping you drop unwanted pounds in a brief period of time – weeks or sometimes even in days. You might be advised to consume only juice or soup for the length of the diet, to avoid all fat or carbs, or to cut calories dramatically. Although you will lose weight, you are likely to gain it all back and then some. In addition, these diets can be dangerous to your health, leading to nutrient deficiencies. Sustainable weight loss comes from making healthier food choices, rather than following quick-fix diets. Dieters who take off weight at a rate of 1 to 2 pounds a week are the most successful at keeping that weight off, according to the Centers for Disease Control and Prevention. That's because these dieters tend to make healthy, long-lasting lifestyle changes to their eating habits and physical activity, which carry on throughout their lives. One pound of body weight equals 3,500 calories; therefore, to lose a pound in a week, reduce your daily food intake by 500 calories. A 1,000-calorie deficit will help you shed 2 pounds. Beyond just calorie count, however, you need to focus on foods that give you the biggest nutritional bang to lose weight in a healthy manner. Instead of high-calorie fast foods and sodas, concentrate on making whole foods in appropriate portions the basis of your weight-loss plan. Three large-scale studies involving more than 120,000 men and women over the course of 20 years found that the whole foods most closely linked to weight loss included vegetables, yogurt, nuts, fruits and whole grains; the results were published in the New England Journal of Medicine in 2011. These kinds of foods are full of nutrients like fiber and protein to help you feel satiated, so you don't pack in unneeded calories that make you gain weight. For example, you may choose 1,500 calories a day as your target caloric intake – that's a number that will help most men and active women lose weight, according to the National Heart, Lung and Blood Institute. Don't worry; you won't starve. For breakfast, have a container of plain, low-fat Greek yogurt with 1/2 cup of blueberries and an ounce of chopped walnuts. At lunch, top 2 cups of spinach with 3 ounces of grilled chicken breast and a cup of chopped raw veggies of your choice. For dinner, have 4 ounces of baked salmon with eight asparagus spears and a medium sweet potato. Your dessert might be an ounce of dark chocolate and a small pear. Portion out a tablespoon of extra-virgin olive oil to add to your various meals. This three-meal plan brings you in at roughly 1,200 calories, which leaves room for one or two snacks to keep up your energy. Try an ounce of almonds in the morning and a cup of sliced apple with an ounce of goat cheese mid-afternoon; or whip up a protein shake after your workout. If you're aiming for slightly less than 1,500 calories a day, simply adjust your meal plan accordingly. Choosing exercise and physical activity that you like and will stick with is key to healthy weight loss. You also want your program to be well balanced, with aerobic, strength and balance exercises included. Aim for at least 30 minutes of exercise five days a week. If you weigh 155 pounds, walking at a brisk pace for 30 minutes burns 133 calories; light bicycling for the same amount of time burns 211 calories; slow, freestyle lap swimming burns 246 calories; and running at a pace of 6 miles per hour burns 352 calories. Combine traditional exercises like these with routine daily activities such as pushing a stroller, gardening, walking the dog or shoveling snow to create a calorie deficit. HelpGuide.org: What’s the Best Exercise Plan for Me? Can You Really Lose 20 Pounds on the Soup Diet? Can You Lose Weight Just by Eating Healthier?